The HydroForce Injection Sprayer is based upon an injection system that consists of a specially designed valve that injects a concentrate chemical into the high-pressure water flow from the machine. Hydro-Force is designed for use with incoming water pressure of 400 P.S.I. The water flow is automatically reduced as it passes through the injector valve, thus reducing the pressure approximately 64%. To obtain the actual working pressure of your Hydro-Force Injection Sprayer, multiply your incoming pressure by 36%. 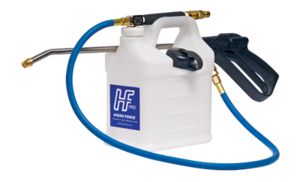 The Hydro-Force injection sprayer is factory set inject chemicals at a 1 to 8 ratio. Other chemicals may be used but should be prepared for a 1 to 8 dilution. The Hydro-Force pressure can be increased by putting a smaller jet at the end of the wand. This will, however, decrease the injection rate of your concentrate chemical. Your injection ratio may also change depending on the viscosity (thickness) of your concentrate chemical. The 1 to 8 ratio is based upon chemicals with a similar viscosity to water. The injection ratio can also be slightly affected by your main flow water temperature. This is generally not enough of a change to appreciably change effective-ness of your system. We do, however, recommend the water temperature be kept below 200 degrees Fahrenheit, as higher temperatures can cause problems on the injection. Hydro-Force Injection Sprayer eliminates the hassles of measuring and mixing. We recommend you keep an extra 5-quart container or two on your truck to make sure you never run out and to facilitate quick changes of your chemical containers. Remember that Hydro-Force Injection Sprayers automatically mixes at a 1 to 8 ratio. If your 5-quart container is full then that is the same as holding an 11 gallon pump sprayer of regular, ready to use pre-spray. We have found that Hydro-Force Injection Sprayers offer better penetration and overall coverage than most other sprayers. It is therefore possible to pre-spray your jobs up to 45 minutes before you reach that area to be cleaned. An effective way to use the Hydro-Force for pre-conditioning or small to medium jobs is to start at the door coming into the house, spraying all the traffic areas, working your way to the farthest point back in your job. You have then completed your pre-conditioning in just seconds and are prepared to hook up your wand and start cleaning your way out. Keep in that our Hydro-Force is spraying 3 to 4 times the amount of product your normal pump sprayer is putting out. This means you must move quickly to avoid over-applying. Protector should be applied in even slightly overlapping strokes.